The complete Wireless Food-Ordering system (WFOS) consists of four Clients and one Application Server: "Lobby-end + Kitchen-end + Service Desk + Backend Management System + App Server"
Lobby-End Pad: Customers can order food, asking for service, and check out through Lobby-End on pad. Kitchen-End Pad: The chef and bar-tender can directly view customers' orders(dishes/drink) through kitchen-End on pad and be able to process the orders immediately (cook/ finish/deliver). At the meantime, the customers can clearly see the realtime ordering status from the Lobby-end pad, too. Service Desk: The waiters/waitresses can open tables/transfer tables/ combine tables/merge tables, manage customers' orders and respond to customers' needs through web browser on the PC computer. 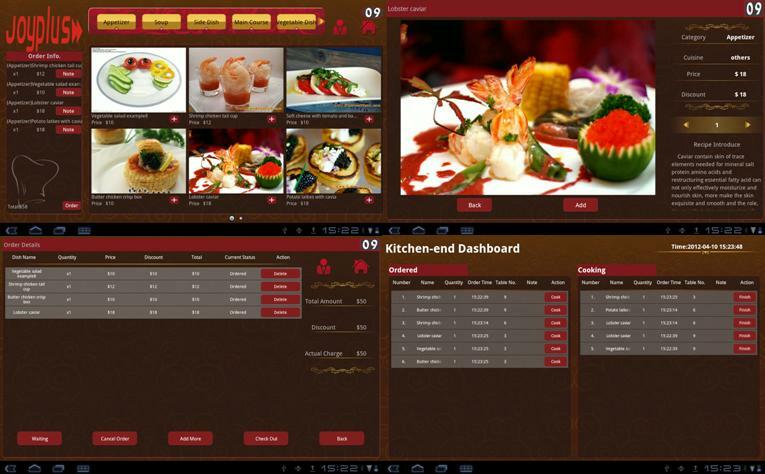 Back-End Management System: The managers and administrative staff can manage the basic information (tables, menus, dishes) and update the newest dishes with zero cost through the web-browsers on the PC computers. In addition, it can also manage the orders and financial information. 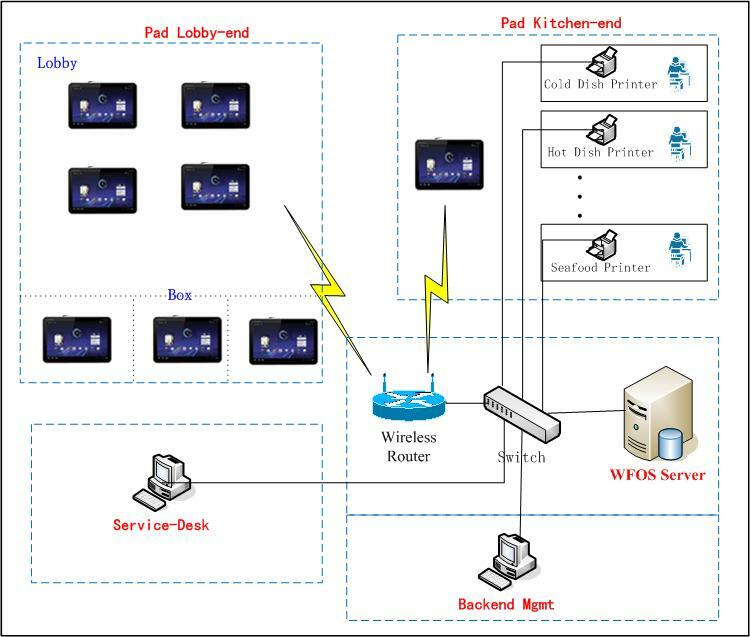 o C/S Structure: Both Lobby-end and Kithcen-end are Pad Clients which run on tablet PC. They and Application Server consittute C/S architecture. o B/S Structure: Both Service Desk and Backend Management System are web Clients which are accessed through web browser. They and Application Server constitute B/S architecture.